Editors note: There is one photo, one infographic, and one video associated with this press release. Everyone knows that sometimes the best medicine is a hug from mom or dad and the latest science backs it up. According to the recent whitepaper The Power of Human Touch for Babies*, funded by Huggies® Diapers, babies experience many health benefits from skin-to-skin hugging. Understanding the power of the hug, hospital neonatal intensive care units are increasingly integrating hugging programs in an environment that in the past has had a greater focus on technology and medicine. A recent survey** of Canadian Association of Pediatric Health Centres (CAPHC) member hospitals revealed that 100 per cent of hospitals that did not already have a hugging program were interested in starting one. In response, Huggies created the No Baby Unhugged Initiative. It's helping to raise awareness of the medical benefits of hugs for baby and is showing parents optimal hugging techniques. As part of the initiative, Huggies, in collaboration with CAPHC, has developed a blueprint of guidelines for establishing hospital hugging programs. Huggies goal is to donate $100,000 to hospitals across Canada to initiate new hugging programs. Every time a new mom uploads a baby hug photo on Nobabyunhugged.ca, Huggies ® Diapers makes a donation. "Research has shown that skin-to-skin hugging between mom and baby following childbirth has many important benefits on a newborn's physical and emotional development," Elaine Orrbine, President and CEO of CAPHC. "Hugs from mom and dad are the gold standard. When parents of newborns in the neonatal intensive care unit are unable to provide hugs, hospital hugging programs help fulfill the need." The Power of Human Touch for Babies whitepaper says the benefits of skin-to-skin hugging for a newborn baby include: stabilizing their heart rate to a normal and constant rate, improving sleep, supporting healthy weight gain, increased rates of breast feeding, and improved parent-baby relationship. Hugging can help ill and preterm infants in the NICU cope with the many painful procedures they receive (sometimes as many as a dozen per day) and can facilitate positive transition for parents into their new role as caregivers, to constructively establish the parent-child relationship. 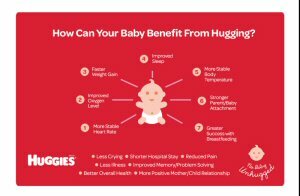 "Huggies is implementing the No Baby Unhugged initiative in order to ensure that all babies get the hugs they need," says Paul Scott, Huggies Brand spokesman. "Huggies believes in the power of hugs and through this initiative, will help hospitals implement their own baby hugging programs by offering a program blueprint of guidelines and funding." According to Ms. Orrbine, in hospitals where they exist, hugging programs offer some of the most coveted volunteering roles. Baby huggers cuddle, rock and sing to newborns, often for several hours at a time. They help to ensure babies get much needed hugs when circumstances prevent a mom from being at her newborn's side. Skin-to-skin: Mom should remove all clothing from the upper body, baby should be in a diaper only. Proper positioning: Mom can lie down or sit up with baby chest to chest and tuck baby's legs up into the fetal position. Baby's head should be turned to one side, so airway is clear and head is supported. Baby's hands should be near her face for self-soothing. Cover up: Baby and mom should be covered with a blanket once in the proper position. Duration: It is important for your baby to go through a full sleep-wake cycle which is usually about 60 minutes as a minimum to get the full benefits and to get the biological systems stabilized. Listen to baby: If baby starts to wiggle around and is no longer comfortable, that's a good time to stop. NOTE: Baby is safest sleeping on her back, not on mother's chest and do not drink hot liquids or cook while hugging baby. To watch the documentary short; download the whitepaper; and learn more about Huggies No Baby Unhugged initiative, visit www.nobabyunhugged.ca. To learn more about CAPHC visit www.CAPHC.org. Kimberly-Clark (NYSE:KMB) and its well-known global brands are an indispensable part of life for people in more than 175 countries. Every day, nearly a quarter of the world's population trust K-C brands and the solutions they provide to enhance their health, hygiene and well-being. With brands such as Kleenex, Scott, Huggies, Pull-Ups, Kotex and Depend, Kimberly-Clark holds the No.1 or No. 2 share position in more than 80 countries. To keep up with the latest K-C news and to learn more about the company's 143-year history of innovation, visit www.kimberly-clark.com or follow us on Facebook and Twitter. * Whitepaper Authors: Britney Benoit, Katelynn Boerner, Marsha Campbell-Yeo, PhD, Christine Chambers, PhD, Centre for Pediatric Pain Research, IWK Health Centre. **Survey of CAPHC member hospitals regarding hugging programs was conducted by CAPHC in 2015. Skin-to-skin hugs have scientifically proven benefits for babies. 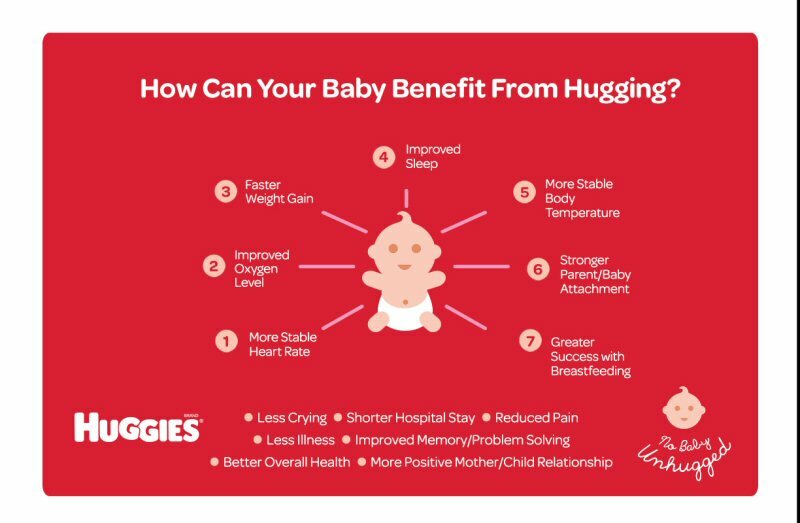 Huggies No Baby Unhugged initiative is helping hospitals that want hugging programs establish them. To learn more about the power of hugs visit nobabyunhugged.ca.